When I stop and just be still, I can breathe easier. I remember why I love God, and why having quiet time is so important and necessary. 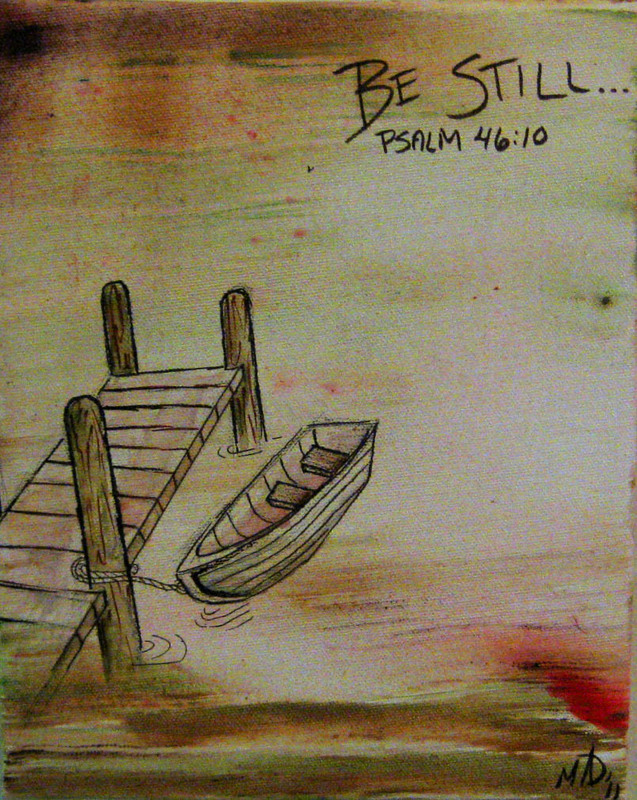 I am reminded how I love creating artwork that will encourage, inspire, and bless people, even if I don't always know it. Tonight, Sunday night, I decided to turn off the radio, tv, and computer, dim the lights, light the fireplace, grab a book and cup of hot tea and just BE STILL. I read a chapter about "never underestimate the power of a seed". Its a true miracle how a tiny little seed can be planted inches below the earth and against gravity and all else, it sprouts up and pushes away the weight of the dirt and moves upward into the light. We all need to plant a seed within the people we are in contact with everyday. A smile, a kind word, or a hug may be the fertilizer someone needs to help them push away the weight of the world, and grow with joy. That was always my intention with my cards and paintings. To encourage people to smile, feel loved and grow, chasing after their dreams! 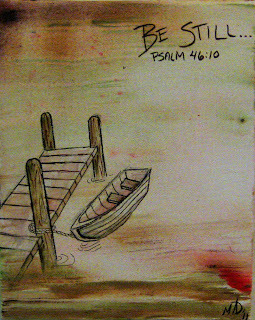 The painting above is from my "Be Still" series, based on Psalm 46:10 (Be still and know that I am God). I hope that it will bring you peace tonight as we get ready to move into the last week of January. As I always try to remind myself, don't be afraid to encourage the people around. You never know when your smile, or the card you give them, or the hug you wrap them in will be what they needed to get through the day. The painting above is available for $35 and 10% will be donated to this month's charity, the Humane Society. E-mail Melissa@lisscatcreations.com if you are interested.